Former heavyweight world champion Wladimir Klitschko has retired from boxing - ruling out a rematch with Britain's Anthony Joshua. The Ukrainian, 41, was knocked out in the 11th round by current champion Joshua at Wembley Stadium in April. Joshua, 27, had hoped Klitschko would sign his rematch clause for a proposed fight in Las Vegas on 11 November. "I have achieved everything I dreamed of, and now I want to start my second career after sports," said Klitschko. The two-time former champion, who held the unified title from 2006-2015 before losing to Joshua's fellow Briton Tyson Fury, ends his career with a record of 64 wins and five defeats. "I would have never imagined that I would have such a long and incredibly successful boxing career," he added. Joshua must now face mandatory challenger Kubrat Pulev before 2 December or risk being stripped of his IBF belt. Bulgarian Pulev, 36, has a record of 25 wins and one defeat, which came to Klitschko in 2014. Klitschko won Olympic super-heavyweight gold at the 1996 Games in Atlanta, before turning professional later that year. He built an unbeaten 24-0 record before losing to American Ross Puritty in 1998 in his only fight to take place in his native Ukraine. After claiming the WBO belt with victory over American Chris Byrd in 2000, Klitschko was upset by South Africa's Corrie Sanders and American Lamon Brewster in 2003 and 2004 respectively. He then went 11 years unbeaten, until losing the WBA, IBF and WBO titles to Fury in November 2015. The Germany-based fighter announced his retirement on a video posted on his website, with so many people trying to access it that the server crashed. In his video statement, Klitschko said: "Twenty-seven years ago I started my journey in sport. It was the best choice of a profession I could have made. Because of this choice I have travelled the world, learned new languages, created business, built intellectual properties, helped people in need. "At some point in our lives we need to switch our careers and get ourselves ready for the next chapter - obviously I am not an exception to this. "I am expecting and hoping my next career, which I have already been planning and working on for some years, will be at least as successful as the previous one, if not more successful." Klitschko's bout with 2012 Olympic gold medallist Joshua was the most lucrative fight in British boxing history - the fighters were reported to have shared prize money of £30m - and was only the third time a fight had been televised by two American networks. 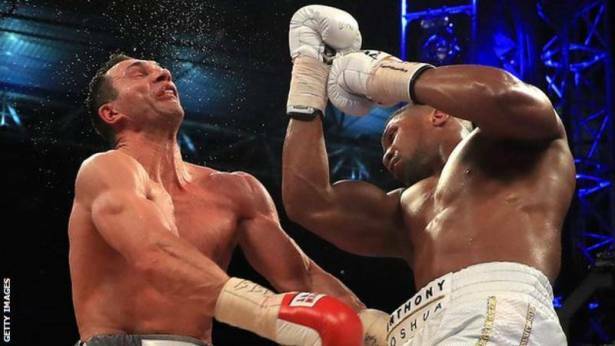 It turned out to be a memorable occasion in front of a post-war record 90,000 fans, as Joshua knocked down Klitschko in the fifth round before he was then dropped himself in the sixth - the first time in the Briton's career. Promoter Eddie Hearn had said the rematch could take place in Cardiff's Principality Stadium, but Las Vegas became a frontrunner in recent weeks until Klitschko's retirement. Hearn said he was informed of Klitschko's decision by the Ukrainian's manager Bernd Boente on Thursday morning. "We wish him all the success," Hearn said on social media.